We’ve all done it, whether it was a spot of being careless with mud-tracked shoes or getting overzealous about telling a story with a glass of wine in hand. Spills and stains can easily ensue and are often more likely to occur in areas of your home where stains are never tolerated! Getting upset about a spillage doesn’t do anybody involved any favours so take a deep breath, think rationally and follow these three steps. Although we don’t always immediately notice spills after they happen it is important to act fast once you have seen the affected area. 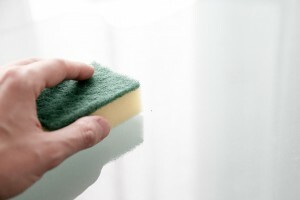 Scrape up or blot up any excess spillage before applying any cleaners and never try to rub or scrub a stain out. 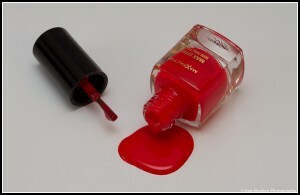 Blotting works wonders and will help you to get most of the spill out before resorting to more drastic measures! Work from the outside of the stain inwards to prevent it from spreading and if you are worried about wet spots, use a hairdryer to speed up the blotting process. It is important that you act fast, but also equally important that you act rationally. Panicking leads to making rash decisions and silly mistakes that you will regret later. If you tackle the stain as best you can with the knowledge you have and it is still there, simply get in touch with a professional cleaner and they will be right over. Trying to desperately remove the stain using extreme chemicals could only serve to worsen the situation, so if you can’t easily get rid of it using your household fabric cleaners, call in a professional cleaner who will be able to help you. You might think this a superfluous point but it sometimes makes all the difference between a ruined sofa and a sofa swiftly saved. Read your labels! Before applying any chemical or natural product to your stain or spill, read the label to see whether or not it could be harmful to you or the material you are using this on. Obviously, we rarely have time to do this in the heat of the moment, so read your labels beforehand so that you know exactly what you need when the time comes. If your sofa or your recliner has a label detailing fabric care and maintenance guides, this might also be a useful source of information. 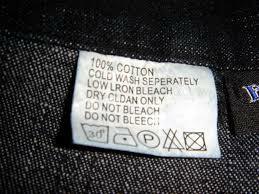 Some fabrics are dry clean only, whereas others react badly to particular chemicals. Getting an idea of what works and what doesn’t on your home furniture is really useful, especially when tackling a spill in good time. Are you putting your toddler at risk when you clean your house? 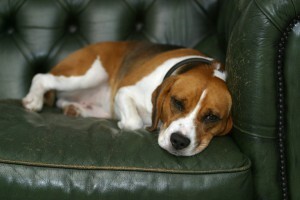 Is your dog safe around cleaning products? When using cleaning products in any quantity around the house, you need to consider the safety of those products on your family. If you have young children or pets that could come into contact with your detergents, polishes and other cleaners, it may be a good idea to research more pet-friendly and child-friendly ways to approach to job. Chemical cleaners can be aggressive, which is what’s needed when you’re dealing with tough stains, but they can also be overzealous in getting the job done. While you may be well acquainted with detergent fumes and scents, young children are not so resilient, and cats and dogs have even more sensitive noses. If you’re worried about the harm that chemical cleaners may cause to children and pets, why not consider some natural alternatives? 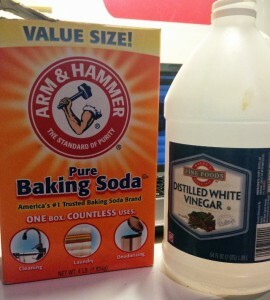 The old combination of baking soda and vinegar often works wonders to reduce or remove spills and ground-in stains, though there are of course many natural cleaning products available to buy. So now you’ve given everything a good clean, have dried off, wiped down and aired out, you should be done, right? Not quite. Don’t forget that some cleaning solutions need to be left on for a while or dry naturally. In order to prevent slip and fall hazards, it is important that you wait until the area or room is completely dry before letting pets and children roam around. It is always better to be safe than sorry. All-purpose cleaners are designed to deal with a wide range of stains and spills. While it’s handy to be able to use just one bottle for everything, these detergents may not always be pet-safe or child-safe. If you absolutely have to use an all-purpose cleaner, try to avoid areas where children or pets are likely to be, and make sure to ventilate the room thoroughly, drying everything out before allowing others to use it. Cleaning around the home is a daily chore – we all have to do it. But what about specialist jobs that you can’t do yourself? If you’re unsure about how to tackle carpets and upholstery, ovens, drains or any other difficult areas in your home, call a professional. A qualified cleaning expert will have the experience and the tools necessary to provide first class cleaning and hygiene solutions that are effective as well as safe for all your family members, four-legged ones included. They can also provide useful advice on the best solutions for keeping your home clean and smelling fresh all year round. It can be upsetting to find a stain on your upholstery, particularly if you take good care of your furniture. But accidents will happen and not all guests are careful with other people’s possessions. If you find a new stain or watermark on your sofa, armchair or other upholstered item, there are steps you can take to quickly reduce its severity or even remove it altogether. Apple Clean offer professional carpet and upholstery cleaning services designed to keep your home clean and clear. 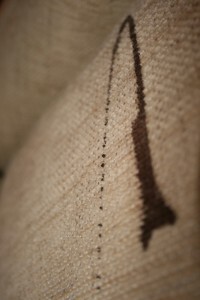 If you find a watermark or stain on your sofa or three-piece suite that you are unable to remove, give us a call. We’re an experienced and friendly team of cleaners with everything you need to get your upholstery looking as good as new again. Here’s our advice on getting a watermark off you armchair or sofa. Even the cleanest piece of furniture has wear and tear. This can mean deposits of dust and food particles, or dry skin residue. You’ll need to thoroughly sanitise the area before attempting to clean any part of it, particularly if you have young children prone to sticky fingers or pets. Vacuum the area first to remove dust or crumbs; you can also try a lint roller over the area just to make sure you’ve completely cleared it. Check to make sure that your fabric is suitable for vacuuming, as some fabrics may be too delicate, so caution is needed. Dampen a cloth with cold water and then use it to rub at and dab away at the stained part of the upholstery. Work with care according to the fabric requirements; some fabrics are more hardwearing than others. Make sure you’re not too vigorous with your rubbing – that goes for every type of fabric, and particularly for water marks. By gently rubbing at the stain in a circling motion from the outside towards the centre, you help to prevent the spread of the stain as you will be focusing your cleaning action in and around the original water mark area. Depending on the type of fabric – hard-wearing cotton, natural fibres, man-made synthetics – you may need to use a specialist cleaning agent to get the best results. However if you are not cleaning up a ‘stain’ and instead are trying to tackle a watermark left over from clearing a previous stain, then you may not need a cleaning product at all. Fold a few paper towels into a stack and place on top of the stained upholstery, then put something heavy on top of it to apply pressure, or press down firmly using your hands. You will also need a hair dryer set to the ‘cool’ setting or a fan that you can aim at the stained area. The force of the air will help the towels to absorb the moisture. If the watermark is still visible, you will need to remoisten the area and repeat the process. It may be a repetitive process but, if done with patience and care, it is a great way to successfully tackle water marks on your upholstery.